I'm a member of Literacy Educators Coalition. Take a look. You'll find me under S.
Perhaps it may seem silly to you that I'm so proud of being a literacy educator when I'm not currently teaching in a classroom? Yet I believe that I teach and reach out to parents and teachers through this blog. Children's literacy, literature and learning are my passions; my dream is to ignite that passion in others. One of the things I love about the Coalition of Concerned Literacy Educators is what they believe, their credo I guess. What I believe, so my credo too. I received permission to reprint it here in its entirety, because I think it makes such good sense, and thought you might like to read it. Learning to read begins at birth as family members read aloud to their infants. Family members have an important role to play in their children’s literacy development by talking with them and demonstrating how print is used at home and out in the community. Readers use a range of strategies to construct meaning. They draw upon the symbols (letters, signs, numbers, icons, etc) and the associated sounds of the language, the grammar of the language and the meanings of the language. The teaching of phonics is closely related to the teaching of writing; and the teaching of writing is closely related to the teaching of reading. Reading and writing are inter-related and occur in every-day life practices. Readers read for many purposes: to be informed, delighted, challenged, amused, comforted, entertained and enlightened. 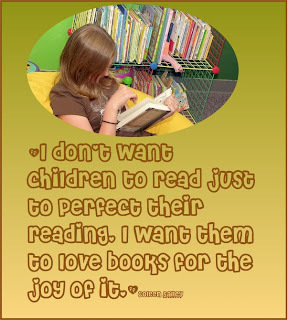 In our teaching of literacy, the reasons for reading are highlighted, not forgotten. Reading and writing help children to understand their own world, but also introduce them to wider worlds, both real and imaginary. Real texts invite children to want to read. They foster curiosity, passion, joy and wonder. Real texts include print-based materials and texts on-screen (eg computers, mobile phones, automatic tellers). Print-based materials may include signs in the environment, greeting cards and many other forms of print as well as traditional books. On-screen texts may include still and moving images, voice and music as well as printed words. Ready access to real texts in classrooms, school libraries and community libraries is crucial. We believe it’s essential for school libraries to be staffed by trained teacher-librarians. Decisions about classroom literacy programs and assessment are best made on site by those working with the students. Only then can literacy instruction be tailored to students with different needs. Students learn in different ways – one size does not fit all. Valid, reliable assessment is a continuous process; not a single event. The main purpose of continuous assessment is to inform teaching and improve learning. It is the basis of the most effective communication with parents about their children’s progress. Teachers need to be involved in continuous professional learning. They need to be able to articulate their beliefs and explain their practices to parents and the wider community. Whoever worked this out did such a great job! I love the emphasis on rationality and common sense, yet there are so many points I can and do feel passionate about. Did you catch the part about real texts, and how they invite kids to WANT to read? How about the importance of trained teacher-librarians? Do you agree that valid reliable assessment is a continuous process; not a single event? And that one size doesn't fit all with learning? Oh, wouldn't it be wonderful if all politicians and decision-making bureaucrats espoused these principles too! The Literacy Educators site has an Information page with interesting and thought-provoking articles parents and teachers will enjoy. There's also a page of Links and a Good News! page. If you're an Australian literacy educator, perhaps a teacher, an author, or a literacy-loving blogger like me, why not stand up and be counted in Australia's National Year of Reading, and join the Coalition? I think you Australian Literacy Educators have it figured out! I wish some US Educators would listen to you!! (Of course, not all. There are some fine literacy educators here too). Can you access the information page even if you aren't a member of the group? It sounds like my philosophy of literacy education would match up with theirs!! @Jackie H.I am pretty sure you can, although I am maybe logged in automatically. Can you try it and let us know? Cool that you identify with those principles too, Jackie! Yes yes yes you are a literacy educator- and what's more you rock! Thank you so much for all your hard work keeping parents like me updated with the cutting edge of literacy in this country and internationally. @Green Mama Thanks for your support!